I've seen a couple of postings on other blogs complaining about meteorologists' recent forecasts in the Central U.S. pertaining to the upcoming Christmas - Boxing Day storm. So, I thought I'd explain what I believe is part of the issue. The more conscientious meteorologists always check the current state of the atmosphere before making a forecast using the computer models or other tools. Over the eastern Pacific, I look at the weather satellite loop. By doing so this morning, I found there were two "closed" lows (360° circulations) off the coast of Oregon at 6am CST (the data gathering time for the models). They are marked by the red circles. There is also a weakening "short wave trough" along the southern jet stream approaching Baja (red dashed lines). Now, let's look at the North American Model's initial analysis (as of 6am) to see how well it reflects what is shown in the satellite loop. 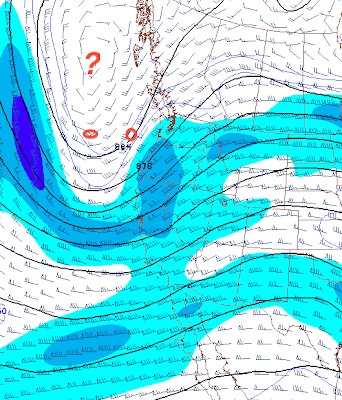 The wind barbs off Oregon should be in a 360° configuration around each of the red ovals but they are not, meaning the model has not correctly analyzed the weather system. Farther north where the barbs are in the 360° configuration, the satellite does not support the depicted wind pattern. It means the computer model is getting off to a bad start. Or, to put it another way, garbage in/garbage out. And, when I update my Christmas forecast this afternoon, another disclaimer about low confidence. But, you say, "Your blog was able to accurately forecast Hurricane Sandy five days in advance. Why are you having such trouble with this storm?" Reasonable question. Answer: Data! When Sandy was south of Cuba (when I started posting warnings about Sandy) NOAA was flying both hurricane hunter aircraft and its Gulfstream jet to collect data in and around the storm. The initial analysis were excellent. NOAA usually doesn't do that outside of hurricanes. If this storm was off the coast of California, it would at least be measured on all sides by jumbo jets going to/from Hawaii. Not as good as Sandy but reasonable data. 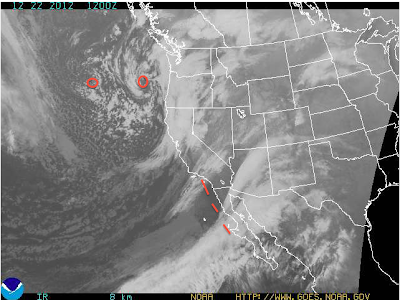 Unfortunately, the storm is too far north to catch the California - Hawaii traffic. There are single daily flights from Seattle and Portland to Honolulu but that those don't help much in this case. If our politicians in D.C. would ever put our priorities straight, they would provide the funding for NOAA to move the Gulfstream to the West Coast in winter and fly it in these situations. The cost/benefit to the U.S. economy would be huge.